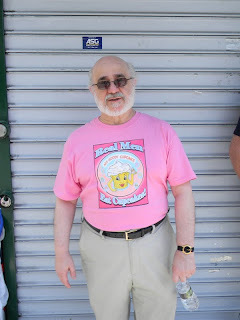 "5 Boro Tour New York"
John C. - Father of the owner of Ms. Goody Cupcake a new bakery on Passyunk Avenue. Over the past month I've been indulging my sweet tooth at nearly every opportunity. Candy, cupcakes, ice creams, even sweet honey bathed bagels. Some of these indulgences have been worth the caloric splurge, other bites haven't been worth the extra cycling miles it will take for me to shed the carb intake. Since I've been collecting stories and photos of each food find, I thought I'd post a mini-review of a few of my recent finds. First up are the cupcakes from Ms. Goody Cupcake, a new store located on Passyunk Avenue at Mifflin Street in South Philadelphia. We first discovered the shop in late July, during the 3rd Annual East Passyunk Avenue Car Show. 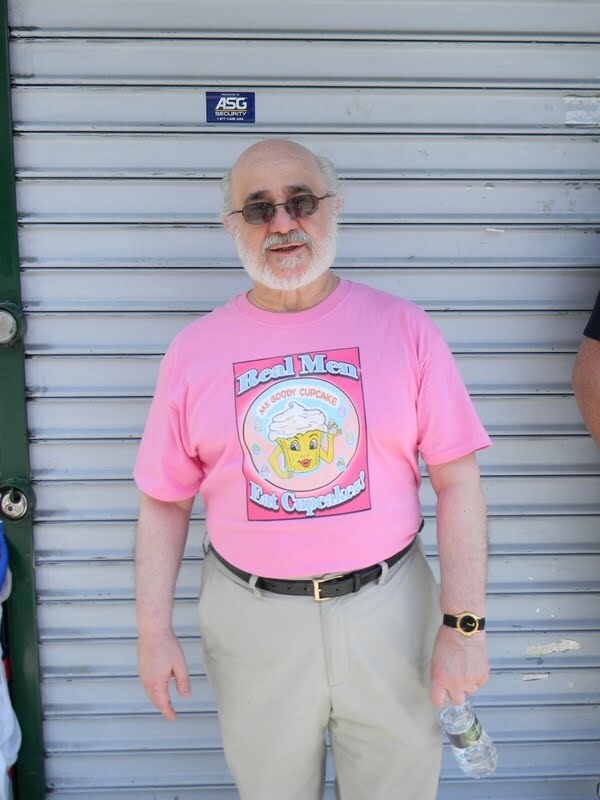 I spotted John C. in his bright pink "Real Men Eat Cupcakes" tee shirt and was intrigued. We chatted for a few moments, exchanging pleasantries and quips and when I asked if I could take his photo for my blog/photo projects, we both discovered our mutual connection to food and photography. Next thing I knew, John was escorting Liz, Nate and I into his daughter's cupcake store where we were offered samples, a back stage tour of the shop and an ample amount of photo opportunities. It was like a press junket welcoming to a film or tv premier with the added benefit of sweets in exchange for the "interview" Ms. Goody Cupcake was doing a soft opening during the car show, promoting the upcoming opening of the new store. They were giving out mini cupcake samples of the goodies. The anticipated opening was scheduled for the beginning of August. As the dog days rolled on and the store hadn't yet opened, I began to get worried - I really liked what I tasted and saw in the bakery. Cupcakes with interesting names and themes, creative designs and unique flavors. I wanted to try the full-size cupcakes and I wanted to know more about the crazy South Philly family that was running the business. The whole scene of the shop reminded me of Philadelphia's version of Cake Boss and Staten Island Cakes but with better treats and reasonable prices. The store opened a few weeks after the anticipated date. Ironically, it was during Tuesday's earthquake that we got to test out the full-size cupcakes. Liz, out on a scouting mission for all of us, headed up to "The Avenue" with Nate and our friend, Steven. They purchased a half-dozen cupcakes, 6 for $13. Of the 6 purchased, 2 whole ones and 2 halves made it home for me to sample and report. The full-sized cupcakes were as good as the mini ones we tasted in July. Lime Margarita; Chocolate-Take-A-Break (a chocolate cupcake with butter cream frosting topped with a mini donut); Chocolate Cookie Dough with Chocolate Fudge Butter cream Frosting; Red Velvet "Love" Philly cupcakes. All were moist, delicious, fresh and full of real butter and most importantly, good flavor. Not a lick of faux ingredients or too much (if any) shortening. Run, ride but don't walk to this new cup cake shop located at 1838 East Passyunk Avenue. Spread Bagelry had an inauspicious start back in May of this year. After months of building delays and all the hype about these mind-blowing bagels, the store opened, only to be shuttered for another 3 months due to a fire that occurred on opening day! My co-workers and I speculated that the store owners ran out of money building the place; we thought they would never reopen. Perhaps the insurance claims adjuster took too long in getting the check cut for all the damages. Or maybe the City's licencing guys needed some actual dough slipped their way to help feed their hunger so the store could pass inspection to open. Whatever the story, the shop is now up and running. The bagels are fantastic. Not that I'm a fan of spending more than a dollar on a bagel, it's probably a good thing that they are on the pricier side; I'd be there way too often if they were cheaper. These are a splurge well worth their weight in biallys, bagels and imported flour. For my lunch - I had a whitefish spread on a whole wheat everything bagel. It was HUGE! Cream cheese from an organic dairy farm in Lancaster County. The best, ripest, sweetest tomato I ever ate - and since I HATE raw tomatoes, that's saying something. I ate the whole thing. The onions were good too, they must use Vidalla onions because they were sweet without that sulfuric bite. The whitefish was a tad too salty but otherwise it was fresh and delicious - and I enjoyed every morsel. $9 bucks for this satisfying and filling sandwich. Gotta bike 40 miles to work off those calories! Normally I eschew reality tv programs. I'm not a fan of cooking reality programs either. They are either so overly exaggerated or fake that I get agita watching people glamorize what is one of the hardest industries in which to toil. I prefer to watch edgy cooking shows, classic old programs like the Drunk Chef Galloping Gourmet and The French Chef or even those Diners Drive-ins and Dives/Food History programs. However something about Vinnie and his cute puppy dog eyes and the fact that his being gay is such a non-issue grabbed my attention. I had to check out his store. While Staten Island isn't that big, where The Cake Artist is located was way across the island from the village of Great Kills. We had reason to head over to the other side of Staten Island making the trip to the bakery part of our driving errands. The visit to the store was disappointing. Vinnie was inside and we got to meet him and chat. Status about his show, Staten Island Cakes, is on hold; there was an air of uncertainty about the bakery, we weren't even sure the shop was open. The cupcakes looked good and the cake was mostly moist and tasty. The prices were a bargain, 2 bucks a pop. Now, I have to confess, I normally do not like frosting/icing and I'm not a cupcake connoisseur. They are generally a lot of fluff and no taste. I can't stand expensive frilly desserts that doesn't satisfy. These cupcakes almost tip into this realm. Fancy baubles with no pay-off. It was...it was the soap the frosting that ruined them. Almost every cupcake's frosting was entirely devoid of natural butter and was instead made with waxy shortening. Don't put a birthday candle in them, the whole thing will flare up! Three of us tasted the cupcakes and we all agreed they were a major disappointment. The S'mores cupcake was the only one we gave high marks to - as it was over-all good. Great chocolate flavor, fudge icing, a mini marshmallow in the center and a graham cracker bottom. Ah, Vinnie B. I hope your show gets picked up for another season or else it's back to baking lessons for you. And one final piece of advice, Dude, get some buttah in yo' shop! Greetings from the Amish community of Lebanon,Pa.And watch-out folks for Irene if you live in the east coast. Richard from Amish Stories. Nothing worse than disappointing baked goods; glad to know I don't need to take a trek to Staten Island, it will be hard enough to get around to trying the shop on Passyunk Ave.
Close up shot of the white fish sandwich is awesome, makes it look so good! I am drooling! Those little tasty cakes look delightful Denine!